During class we explored the motor skill of rolling. The babies were guided from tummy time into a roll onto their backs. Later they were guided from their backs onto their tummy. The parents learned tips for motor skill development to practice at home such as bending and stretching baby’s legs, rubbing the abdomen, and rolling baby onto her side. I explained the importance of floor time for baby to learn how to roll. “In a sitting position it is almost impossible for the baby to learn how to roll because much less of her body is in contact with the ground. She must learn how to shift her weight and move her arm or leg to take her onto her side and tummy/back,” I said. The moms noticed how the babies enjoyed being moved from their backs to their sides and finally to their tummies, and then back to their backs again. The following week at class the mother who asked questions about floor time was smiling when she arrived at class. “Guess who has been enjoying floor time?!? She is doing tummy time and rolling all over the place. She loves it!” The mother continued to explain that she and her husband were enjoying watching sports and keeping the baby near them on a play mat. All seemed to be enjoying this family time! 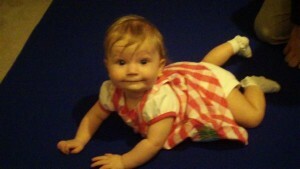 This entry was posted in ROLLING, TUMMY TIME and tagged 3-6 months, coordination, strength. Bookmark the permalink.